As the vote on the Polk Street redesign approaches in the coming months, the SFMTA Board of Directors last week requested that planners present the board with a pilot project option for bolder bike safety improvements along the length of the project area. 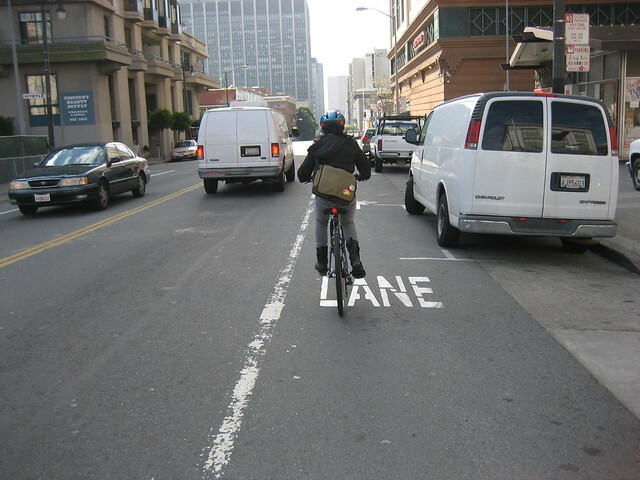 Currently, the SFMTA’s preferred option calls only for sharrows and rush-hour parking bans on the northbound segment of the street where merchant opposition is strongest. The southbound side of that stretch would get a conventional, unprotected bike lane. Board member Cheryl Brinkman introduced the resolution, which doesn’t specify a bike lane design but calls for “a pilot plan option, similar to what we have on the agenda for Folsom Street today,” referring to the buffered bike lane currently being installed on that street. “It should be of significant time, should stretch the entire length of the project area, and success or failure metrics should be data-driven,” she said. So far, the parking-obsessed merchants on Polk have been impervious to data, as has Supervisor David Chiu, but perhaps they’ll come around when improvements are actually on the ground and the sky doesn’t fall. Enjoy the Thanksgiving weekend, everyone. We’ll be back on Monday. Truly, RA, you need to get out more. I offered to meet with you – even buy the beer – to talk facts and you refused. Shortly after that, you avoided introducing yourself at an MTA Open House. Why would I want to have a beer with you? And since when have you been a source of “facts” on anything? Is this issue about schmoozing with you folks? They were lied to, almost none had actually seen the proposals, and by the time they actually saw them, fear had already decided for them. Even fewer actually understood the implications of the designs. Chiu pointed out that the funding is time-sensitive and delays could cause it to be lost. Goes both ways; too much stereotyping and scapegoating all the way around. I’m not a fanatic. I ride a bike to get around and by doing so I spare the air and take up less space. I would like to do so safely. RA has his own peculiar, non-mathematical way of interpreting the stats. Only RA has the facts? Here’s one you seem not to know: people are way bolder – and more aggressive – when behind a screen. So yes, avoiding direct contact is cowardly. You look silly, Dude. A sad, sad one who is trying vainly to extend his 15 minutes. Polk is in the top 7% for collisions. Totally preventable and when it comes to lives, even yours, RA, that’s just not acceptable – ever. Why do you want SF to be eating the dust, literally, of MANY other cities in the US and the World that are clued into the fact that they develop non-car transit or die? Don’t you like SF, RA? ‘Riding a bike in a major American city is simply unsafe’ Like I said, get out more, RA. You have no idea what you’re talking about. Why don’t you share some of your previously undisclosed “facts” with us on this thread? How would my having a beer with you shed light on anything under discussion? Where are you getting that number? Please share the document with us. I like SF just fine. It’s you folks who want to change it to the specifications of your small minority. You folks still haven’t come to grips with the implications of the UC study that showed how dramatically the city has always under-counted cycling injuries. I’ve heard this charge about packing that meeting with people from outside before, but I’ve never seen any evidence for it. The people of Polk Gulch were quite right to be concerned that City Hall and the Bicycle Coalition were about to take away 200 parking spaces on Polk to make bike lanes.